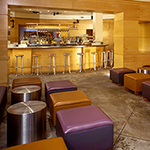 In club venues, Shuffle appears most often as upholstered stools in lounge spaces. They are paired commonly with sofas and tables that are located around the perimeter of a given space. For a club setting, Shuffle allows people to change their orientation or directionality to respond to conversational shifts. Often, a stool is functionally ambiguous; it is open to interpretation about using it as table or seat. The growth of club life has stimulated the proliferation and revival of stools that are used in the Shuffle furniture arrangement. Stool, the most ancient form of seat-furniture for one person, was known and used in various forms for at least five thousand years. Examples are recorded as early as the Third to Fourth dynasties of Ancient Egypt (2980-2476 BCE). The stool was used at all levels of society, from royalty to ordinary citizens. Stylistic variations were numerous. Stools have been common to all subsequent civilizations. Folding stools with skin or fabric seats, and solid framed stools with wood or rush seats, were known to the Egyptians, the early Greeks, Romans and Vikings. There are many types of stools, including hassock, ottoman and pouffe. Hassock, a firm circular or rectangular cushion, is used as a footstool, or for kneeling on in church. The word occurs as early as the 16th century. Hassocks in the 18th century were still primitive, unlike the well-stuffed needlework cushions that furnished the pews of Victorian churches. In 20th century nomenclature, a stool is generally not upholstered, but an ottoman is. A stool seats one person, an ottoman seats two or more. A pouffe may seat one or more people; it is totally upholstered and takes the form of a big cushion; no legs are visible. In the mid 20th century, stools from the Modernist period were generally not upholstered, allowing a person to determine whether to use a stool for seating or as a table. Based on the chronological sequence established, most 20th century stools were designed to use interchangeably as seats or tables. From the 1930s to 2000, a few wood stools became iconic statements. Finnish architect Alvar Aalto designed two lightweight stools, one in 1933; the other, 1954. Aalto's 3 Leg Stool, Model No. 60 (1933), is constructed of bent laminated birch; originally it came in all natural or curled birch with a black, red or blue top with birch legs. The Aalto Stool X600 evolved from Model No. 60; the handmade legs open up at the seat level into a fan shape. Aalto's stools are also versatile in that they can be stacked. Another early stacking stool is Dot, designed by Arne Jacobsen for Fritz Hansen in the 1950s, about the same time that Jacobsen created the Ant chair. Dot was presented to the market in 1954 as a three-legged stool in veneer. In 1970 it was reiterated as a four-legged stool. These four stools function flexibly as either a seat or a table surface. Wooden stools designed for sitting, because a gentle curve of the seat disallows it as a table. Sori Yanagi's Butterfly Stool (1954) is comprised of a curved maple seat with a chrome finished connector, or curved rosewood with a brass connector. The German manufacturer, Vitra, states that the Butterfly blends Eastern shapes with the technique developed by Charles and Ray Eames of shaping plywood. Charles and Ray Eames' Walnut Stool for Herman Miller (c1960) was designed for the lobby of the Time Life Building in New York City, but they became popular in a number of settings. There are three design variations in the lathe-turned stem between top and base. Design Within Reach advertised them in 2011 as acting as low tables or simple seats appropriate for modern or traditional surroundings. A stool meant for seating only is the Taburet M Stacking Stool, designed in 2000 by Danish craftsman Jorgen Moller. Jasper Morrison designed two cork stool collections in the decade of 2000. The first of these, Moooi Corks, is available in two heights. The high version is used as a stool or side table; the low one works as a small coffee table or ottoman. Morrison's cork stool for Vitra has been described variously as belonging to a Cork Family, and as three small friends, robustly built, stable, individual in character and lovable in appearance. Whether as side-tables or as stools, the three stools benefit from the properties of cork-comparatively light, tough and with a pleasant soft feel." An ottoman is not technically a stool. An ottoman is always upholstered, and usually its legs are visible. It seats one or more people. Historically an ottoman was a long upholstered seat, with or without a back, upon which several people may sit. It originated in Turkey, where the seat was low and broad, and piled with loose cushions. The ottoman was introduced into England in the late 18th century, and was illustrated by Sheraton in The Cabinet-Maker and Upholsterer's Drawing Book (1791-1794). A corner ottoman called a "cozy corner" was popular in the late Victorian period. The ottoman footstool stands on four legs with a stuffed top, usually buttoned, and large enough to be used as a fireside seat. Ottoman became the term for a matching upholstered footstool to a lounge chair. The ottomans described here, however, are those that are designed as an ottoman alone. Low upholstered pieces, such as the Cini Boeri Ottoman (2008), are used in lounge settings. Its deep, wide foam-upholstered seat suggests lounging in a variety of positions. Castors allow it to be rotated, shifted or scooted, as desired. Knoll used highly resilient foam so that the ottoman can double as a table upon which beverages and food may be placed. A pouffe was the mid-Victorian term for a low, deeply sprung ottoman, or a large, stuffed footstool big enough to be used as a seat. Although the spelling pouf is sometimes used, it is incorrect; pouf references an 18th century French hairstyle. A pouffe is distinguished from a stool or an ottoman in that it is completely covered in fabric; no legs are visible.10 It is a large cushion with an internal stiff framework to give it rigidity. In 2011 Design Within Reach described Arne Quinze's Primary Pouf (2000) as "part seat, part table, part color statement.14 It consists of a large cube of weather-repellent patented foam that resists fading or degrading. It is not technically an ottoman, because it has legs, and it is not a pouf (a hairstyle), but a pouffe. It adapts to Shuffle, because it can be a stool, a chair or a table. Shuffle is an effective seating arrangement for those who want to come to clubs to be seen and to observe others. Stools can be rearranged to fit groups of various sizes and to change the orientation or directionality of the user. Depending on the size of the stool, the seat can accommodate multiple people sitting on the edges, causing them lean forward in order to hear other members of their party, often due to the loud music playing. Stools chosen for different designs come in a range of shapes. Stools used in the Shuffle arrangement may or may not be upholstered. If they are upholstered, they may be perceived more for seating than as a table. Low tables, however, also act as stools for seating purposes. In order to create a relaxed atmosphere within cocktail lounges, nightclubs and gastro-lounges, it is important to increase the amount of intimacy within the space. Various levels have visual cues for the users that denote the type of atmosphere the club is trying to portray. When Shuffle is located on the perimeter of a space, away from the action of the dance floor, it gains more permanence than when it is present around the edge of the party space. Prior to 1970, nightclub seating as evidenced in historic photographs and Interior Design magazine illustrated Party of Four as the primary seating strategy. Interior designer Sarah Tomerlin Lee's project for Sybil's Discotheque (1977) required intensive planning for every detail, and she studied discos in the United States and Europe. The term "discotheque" was coined in Europe to describe clubs where there was no live music. Disco was shaped by nightclub DJs who used multiple record players to seamlessly mix tracks from genres such as soul, funk and pop music. These types of clubs emerged in the United States where they were also described as discotheques, but "disco" emerged as the preferred name for this type of club and the music genre associated with it. Disco, a genre of dance music, was popularized during the mid-1970s, peaking during the late 1970s. It had its roots in clubs that catered to African American, gay, psychedelic and other communities. The film, "Saturday Night Fever," was released in December 1977; it was marketed to broaden disco's popularity. Its success helped make disco an international sensation. The disco scene included overwhelming sound, free form dancing and "trippy" lighting. In general, during the decade of 1980, there were fewer examples of published bars and clubs in design trade magazines, in general, and therefore, less use of Shuffle. Although disco music enjoyed a decade of popularity, Americans lost interest earlier than Europeans. Several cultural factors contributed to a backlash against the music in the late 1970s and early 1980s. The demise of the discotheque may account, in part, for the lack of bar and club representations in trade sources. 1) John Gloag, A Complete Dictionary of Furniture (Woodstock, N.Y.: Overlook Press, 1990), 642; Robie G. Blakemoor, History of Interior Design and Furniture: From Ancient Egypt to Nineteenth-Century Europe, 2nd Ed. (New York: John Wiley & Sons, 2006), 15-17. 2) Peter Thornton, Authentic Décor: The Domestic Interior, 1620-1920 (New York: Crescent Books, 1985), 29, 33. 3) Thornton, Authentic Décor, 89. 4) Elephant Stool  Sori Yanagi; Vtira, http://www.vitra.com/en-us/home/range/stools-and-benches/ (accessed: Sept. 10, 2011). 5) Party Set  Verner Panton; Vitra in Catalog, "Design Within Reach" (Aug. 2011): 11. 6) Stones  Maya Lin; Knoll, http://www.knoll.com/products/product.jsp?prod_id=74; Bongo Lamp Stool  Karim Rashid; Offi at UnicaHome, http://www.unicahome.com/p58869/offi/bongo-lamp-stool-by-karim-rashid-for-offi.html. 7) Hivemodern; http://hivemodern.com/product1873/stone-marcel-wanders-kartell-hive; http://hivemodern.com/product389/prince-aha-stool-starck-for-kartell; http://hivemodern.com/product618/la-boheme-2-kartell-by-starck; http://hivemodern.com/product619/la-boheme-3-kartell-by-starck; http://hivemodern.com/pages/products.php?sid=1343 (accessed Jan. 28, 2012). 8) Pebble  Georgina Moss Kyte; Allermuir, http://www.allermuir.co.uk/Products.aspx?RangeId=72 (accessed: Sep. 10, 2011). 9) Jaks  John Coleman; Allemuir, http://www.allermuir.co.uk/Products.aspx?RangeId=73; (accessed: Sep. 10, 2011); InDesignLive, http://www.indesignlive.com/articles/products/furniture/jaks#axzz1Y2By6OVs (accessed: Sep. 15, 2011). 10) Gloag, A Complete Dictionary, 387, 483-85, 534. 11) Mushroom Pouffe  Pierre Paulin; Artifort, Hive Modern, http://hivemodern.com/pages/products.php?sid=2624 (accessed Sep. 15, 2011). 12) Tato Collection of Cerruti Baleri, Architonic, http://www.architonic.com/pmsht/tato-collection-cerruti-baleri/1006873 (accessed Jan. 15, 2012). 13) Lovely Cube  Stuio Cion; Foam-tek, http://www.archiexpo.com/prod/foam-tek/pop-art-poufs-60715-155118.html (accessed: Sept. 10, 2011); http://www.foamteksystem.com/news/en/m2/35/lovely-cube.html (accessed Sep. 15, 2011). 14) Primary Pouf  Arne Quinze; Quinze & Milan; Design Within Reach, http://www.dwr.com/product/primary-pouf.do (accessed Sep. 15, 2011). 15) Chat Pouf  Hiromichi Konno; Soft Line http://www.softline.dk/en/products/all_products/chat_pouf.htm (accessed: Sep. 10, 2011). 16) Lilla  Patrick Norguet; Artifort; Hive Modern, http://hivemodern.com/pages/products.php?sid=2632 (accessed Sep. 15, 2011). 17) CHAT Collection  Nadadora; SANCAL, http://www.sancal.com/producto.php?idP=134&idC=11 (accessed: Sep. 10, 2011). 18) PIX  Ichiro Iwasaki; Arper, http://www.arper.com/en/products/collections/pix (accessed Sept. 12, 2011). 19) International Airport Hotel, Cocktail Lounge, Dublin Airport  Stephenson Gibney & Associates; Dublin, Ireland in Anonymous, "Design in Ireland Today," Interior Design 45, no. 3 (Mar. 1974): 164-66; PhotoCrd: Norman McGrath, Henk Snoek. 20) Tango Restaurant, Chicago Belmont Hotel  Tony and Karen Barone; Chicago, IL in Anonymous, "Rest and Relaxation," Interior Design 46, no. 11 (Nov. 1975): 92-93; PhotoCrd: Alexandre Georges. 21) Sybil's Disco-Dinging, Hilton Hotel  Sarah Tomerlin Lee, Tom Lee Ltd., interior design; New York City in Anonymous, "Sybils," Interior Design 48, no. 8 (Aug. 1977): 154-57; PhotoCrd: Jamie Ardiles-Arce. In 1971, when Sarah's husband died, she took over his design firm, Tom Lee Ltd. She is known as the interior designer of the Helmsley Palace, Parker Meridien Hotel, and The Harley, all in New York; the Willard and Westin hotels in Washington D.C.; Warwick Post Oak Plaza (now renamed) in Houston, New Orleans Meridien, and the St. Paul Hotel. http://www.interiordesign.net/hof/11145-Sarah_Tomerlin_Lee.php (accessed Sep. 8, 2011). 22) Giorgio's Nightclub  Joseph Villano; New York City in Anonymous, "Disco Drama and Dining a la Directoire," Interior Design 49, no. 4 (Apr. 1978): 234-39; PhotoCrd: Jamie Ardiles-Arce. 23) Girard's Nightclub  Robin Jacobsen, Robin Jacobsen Design; Baltimore, MD in Anonymous, "Girard's," Interior Design 49, no. 10 (Oct. 1978): 226-31; PhotoCrd: Jaime Ardiles-Arce. 24) Pulsate describes a group of computer monitors (screens or displays) that create a visually active and animated plane. The effect achieved by the content projected through the monitors constantly alters the spatial experience through light, sound, motion and passage of time. Pulsate can also be installed as an electronic billboard in which an entire wall plane made of monitors. Elizabeth Lee, "Theory Studies: Contemporary Archetypical Practices of Transformative Interior Design (M.A. Thesis, Cornell University, 2010); http://www.intypes.cornell.edu/intypesub.cfm?inTypeID=66 (accessed Sep. 9, 2011). 25) Chameleon is an interior archetype, describes the transformation of an interior by manipulating and varying solid areas of colored light over time on a single plane or throughout the entire spatial envelope. The event emerges when multiple colors cycle at regular intervals on programmable control or by manual means. Elizabeth Lee, "Theory Studies: Contemporary Archetypical Practices of Transformative Interior Design (M.A. Thesis, Cornell University, 2010); http://www.intypes.cornell.edu/intypesub.cfm?inTypeID=66 (accessed Sep. 9, 2011). 26) Palladium Nightclub  Arata Isozaki & Associates, architecture; Fisher Marantz Stone, lighting; Fisher Dachs Associates, theatre planning & design; Adaptive Use, Academy of Music Building  Thomas Lamb; demolished 1998; New York City in "Heaven's Gate, Record Interiors," Architectural Record 173, no. 11 (Mid-Sep. 1985): 128-34; PhotoCrd: Timothy Hursley. 27) G Lounge  James Bartholomew, Richard Bories, Bories and Shearron; Chelsea, New York City in Henry Urbach, "G Whiz," Interior Design 68, no. 10 (Oct. 1997): 146-47; PhotoCrd: Wade Zimmerman. 28) Padded Perimeter is an upholstered wall or walls, or a portion of a wall. Jasmin Cho, "Theory Studies: Archetypical Practices of Contemporary Restaurant Design," (M.A. Thesis, Cornell University, 2009), 113-25; Nathan Wasilewski, "Theory Studies: Archetypical Practices of Contemporary Hotel Design," (M.A. Thesis, Cornell University, 2011), 104-2; Carla Wells, "Theory Studies: Archetypical Spatial Graphic Design Practices in Contemporary Interior Design," (M.A. Thesis, Cornell University, 2012), 47-68; http://intypes.cornell.edu/intypesub.cfm?inTypeID=82 (accessed Sep. 11, 2011). 29) Cafeteria  Ilan Waisbrod, Studio Gaia Architecture and Interiors; New York City in Edie Cohen, "Hold the Trays," Interior Design 69, no. 9 (Sep. 1998): 252-55; PhotoCrd: David M. Joseph. 30) St. Martin's Lane Hotel, Lobby  Philippe Starck, Anda Andrei; Design, Ian Schrager Co.; London, England in Melissa Barrett Rhodes, "Room with a Hue," Interior Design 71, no. 1 (Jan. 2000): 127-32; PhotoCrd: Todd Eberle. 31) Coal bar, Marcel Hotel  Jeffrey Goodman, GoodmanCharlton, design; New York City in Sheila Kim, "Burn, Baby, Burn," Interior Design 73, no. 2 (Feb. 2002): 64; PhotoCrd: Michael Kleinberg, Antoine Bootz. 32) Morimoto Restaurant  Karim Rashid, DAS Architects; New York City in Craig Kellogg, "Chef's Choice," Interior Design 73, no. 2 (Feb. 2002): 158-63; PhotoCrd: David Joseph. 33) White Out describes a space in which all planar surfaces (wall, ceiling, floor), as well as furnishings and furniture are a bleached, bright white. Jasmin Cho, "Theory Studies: Archetypical Practices of Contemporary Restaurant Design," (M.A. Thesis, Cornell University, 2009), 38-45; http://www.intypes.cornell.edu/intypesub.cfm?inTypeID=50 (accessed Sep. 16, 2011). 34) The interior archetype, Light Body, is a large translucent three-dimensional architectural object, or element, such as a column, that is lit fully from within to produce a glowing light. A Light Body is not planar. http://www.intypes.cornell.edu/intypesub.cfm?inTypeID=111 (accessed Sep. 16, 2011). 35) Cruise (bar & lounge)  Landini Associates Pty Ltd.; Sydney, Australia in David Clark, "Landini Associates Create Cruise," Architectural Record Web Exclusive Archives (Sept. 2002); PhotoCrd: Ross Honeyset; The Intype Marching Order is a sequence of repeating forms organized consecutively, one after another, that establish a measured spatial order. http://www.intypes.cornell.edu/intypesub.cfm?inTypeID=95 (accessed Sep. 16, 2011). 36) Li Cuncheddi Hotel, Lobby Lounge  Fabio Novembre, architecture; Sardinia, Italy in Donna Paul, "Sleep Chic," Interior Design 74, no. 1 (Jan. 2003): 228-43; PhotoCrd: Alberto Ferrero. 37) Party of Four describes the archetypical practice of placing four lounge chairs oriented around a cocktail sized table that is not considered a standard four top. Party of Four includes a banquette or sofa directly across from a cocktail table and two chairs. Carla Wells, "Theory Studies: Contemporary Archetypical Practices of Bar and Nightclub Design" (M.A. Thesis, Cornell University, 2011), 139-92. 38) Down the Line is the practice of arranging a long line of identical pieces of furniture in a single row. Rachel Goldfarb, "Theory Studies: Archetypical Practices of Contemporary Resort and Spa Design." (M.A. Thesis, Cornell University, 2008), 83-91; Carla Wells, "Theory Studies: Contemporary Archetypical Practices of Bar and Nightclub Design" (M.A. Thesis, Cornell University, 2011), 70-137. 39) Tabú Ultralounge, MGM Grand Hotel & Casino  Jeffrey Beers, architecture & interior design; Las Vegas, NV in Aric Chen, "Ultra Vegas," Interior Design 74, no. 7 (Jul. 2003): 238-43; PhotoCrd: Eric Laignel. 40) Seven Nightclub  II by IV Design Associates; Toronto, Canada in "IIDA Awards," Interior Design 74, no. 8 (Aug. 2003): 86; PhotoCrd: David Whittaker. 41) Incubate is a shared spatial unit that is isolated from a larger environment. It serves as a transitory office or small meeting area where conversation occurs and ideas develop. Shuqing Yin, "Theory Studies: Archetypical Workplace Practices in Contemporary Interior Design." (M.A. Thesis, Cornell University, 2011), 160-75. 42) Avalon Nightclub  Desgrippes Gobe Group; Chelsea, New York City in Stephen F. Milioti, "Back in the Limelight," Interior Design 74, no. 9 (Sept. 2003): 250-55; PhotoCrd: John Horner. 43) Frisson Supperclub  Scott Kester, Constructive Projects; Tim Murphy, Architecture TM; San Francisco, CA in Zahid Sardar, "Bon Voyage," Interior Design 76, no. 2 (Feb. 2005): 175; PhotoCrd: David Wakely. 44) Slat describes screens composed of regularly spaced thin strips of material, typically wood, and oriented in either a horizontal or vertical direction. Rachel Goldfarb, "Theory Studies: Archetypical Practices of Contemporary Resort and Spa Design," (M.A. Thesis, Cornell University, 2008), 119-25; Elizabeth O'Brien, "Material Archetypes: Contemporary Interior Design and Theory Study," (M.A. Thesis, Cornell University, 2006), 20-29. 45) Bradley Ogden, Lounge, Caesar's Palace Hotel & Casino  Engstrom Design Group; Las Vegas, NV in David Kaufman, "Fireworks: Luck Be a Ladle," Interior Design 76, no. 3 (Mar. 2005): 214-18; PhotoCrd: Eric Laignel. 46) Washington Square, restaurant lounge  David Rockwell Group; Philadelphia, PA in Jorge S. Arango, "The Secret Garden," Interior Design 76, no. 6 (Jun. 2005): 204-09; PhotoCrd: Eric Laignel. 47) Various W Hotels [2005-2011] Yabu Pushelberg, Times Square; Rockwell Group, New York; Studio Gaia; Mexico City, Seoul; United Designers; Doha in Edie Cohen, W: Where, When, and Why," Interior Design Web Archives (Nov. 2009); PhotoCrd: Interior Design Courtesy of W, Starwood Hotels. 48) W Seoul, Lobby Lounge  Studio Gaia, Tony Chi and RAD; Seoul, Korea in Raul Barreneche, "W Hotel," Architectural Record Web Archives (Nov. 2005); PhotoCrd: Seung Hoon Yum. 49) Hospital Club, Bellini Bar  Suzy Hoodless; London, England in Ian Phillips, "Walk Through: A Ward Wins," Interior Design 76, no. 7 (Jul. 2005): 72-76; PhotoCrd: Tom Mannion. 50) STK Restaurant (bar and lounge)  ICrave Design Studios; New York City in Rebecca Flynn Marks, "Fit for a Lady," Interior Design 78, no. 9 (Sep. 2007): 130-34; PhotoCrd: Eric Laignel. 51) Town Danceboutique  Studios Architecture; Washington D.C. in Annie Block, "Best of The Year Awards 2008" Interior Design Web Archives (Dec. 2008); PhotoCrd: Interior Design, Courtesy of Studios Architecture. 52) Soft Room is a space enclosed on two or more of its sides with soft hanging materials, typically draped textile, instead of solid walls. Jasmin Cho, "Theory Studies: Archetypical Practices of Contemporary Restaurant Design." (M.A. Thesis, Cornell University, 2008), 126-35; http://intypes.cornell.edu/intypesub.cfm?inTypeID=36 (accessed Sep. 16, 2011). 53) Various W Hotels [2005-2011] Yabu Pushelberg, Times Square; Rockwell Group, New York; Studio Gaia; Mexico City, Seoul; United Designers; Doha in Edie Cohen, W: Where, When, and Why," Interior Design Web Archives (Nov. 2009); PhotoCrd: Interior Design Courtesy of W, Starwood Hotels. 54) Showcase Stair is an extravagantly designed architectural feature in which the stair itself becomes a prominent display element. Its functionality is often secondary to the spatial drama created by the stair's structure, form, materials and lighting. Leah Scolere, "Theory Studies: Contemporary Retail Design." (M.A. Thesis, Cornell University, 2004), 68-72; Nathan James Wasilewski, "Theory Studies: Archetypical Practices of Contemporary Hotel Design." (M.A. Thesis, Cornell University, 2011), 121-54; http://intypes.cornell.edu/intypesub.cfm?inTypeID=33 (accessed Sep. 16, 2011). 55) Betel Restaurant, Lounge  Martin Brudnizki Design Studio; New York City in Kate Sekules, "Cool as a Cucumber," Interior Design Web Archives (Oct. 2010); PhotoCrd: Anonymous. 56) Lair  Alex Lotovsky, Citiscape Construction Group; New York City in Katie Tandy, "Lair Lounge NYC," Hotel Design, (May 2011): 12-13; PhotoCrd: Katie Tandy. 57) OZONE, Bar and Lounge, Ritz-Carlton Hotel  Kohn Pedersen Fox Associates PC; Wonderwall, interior design; Hong Kong, China in Tony Smyth, "Hi Luxe," Hotel Design, (May 2011):24-34; PhotoCrd: Courtesy of Ritz-Carlton Hotels; "Ozone Bar by Wonderfall, http://hypebeast.com/2011/09/ozone-bar-by-wonderwall/ (accessed Sep. 16, 2011). 58) For the influence of psychotropic drug experimentation on the creation of interior spaces, see Gordon, Alistair. Spaced Out: Radical Environments of the Psychedelic Sixties. New York: Rizzoli, 2008. The space capsule metaphor and analysis is from a paper in progress: Chad Randl, "Caves and Capsules: An Exploration of 1970s Interiors." Jan Jennings, Lecture, "Time Travel: The Space Age, Furturo Interiors and Metaphors for Escape" (2010). 59) Evidence for the use and the chronological sequence of Shuffle as a bar and nightclub archetype was developed from the following sources: 1970 International Airport Hotel, Cocktail Lounge, Dublin Airport  Stephenson Gibney & Associates; Dublin, Ireland in Anonymous, "Design in Ireland Today," Interior Design 45, no. 3 (Mar. 1974): 164-66; PhotoCrd: Norman McGrath, Henk Snoek / Tango Restaurant, Chicago Belmont Hotel  Tony and Karen Barone; Chicago, IL in Anonymous, "Rest and Relaxation," Interior Design 46, no. 11 (Nov. 1975): 92-93; PhotoCrd: Alexandre Georges / Sybil's Disco-Dinging, Hilton Hotel  Sarah Tomerlin Lee, Tom Lee Ltd., interior design; New York City in Anonymous, "Sybils," Interior Design 48, no. 8 (Aug. 1977): 154-57; PhotoCrd: Jamie Ardiles-Arce / Giorgio's Nightclub  Joseph Villano; New York City in Anonymous, "Disco Drama and Dining a la Directoire," Interior Design 49, no. 4 (Apr. 1978): 234-39; PhotoCrd: Jamie Ardiles-Arce./ Girard's Nightclub  Robin Jacobsen, Robin Jacobsen Design; Baltimore, MD in Anonymous, "Girard's," Interior Design 49, no. 10 (Oct. 1978): 226-31; PhotoCrd: Jaime Ardiles-Arce / 1980 Palladium Nightclub  Arata Isozaki & Associates, architecture; Fisher Marantz Stone, lighting; Fisher Dachs Associates, theatre planning & design; Adaptive Use, Academy of Music Building  Thomas Lamb; demolished 1998; New York City in "Heaven's Gate, Record Interiors," Architectural Record 173, no. 11 (Mid-Sep. 1985): 128-34; PhotoCrd: Timothy Hursley / 1990 G Lounge  James Bartholomew, Richard Bories, Bories and Shearron; Chelsea, New York City in Henry Urbach, "G Whiz," Interior Design 68, no. 10 (Oct. 1997): 146-47; PhotoCrd: Wade Zimmerman / Cafeteria  Ilan Waisbrod, Studio Gaia Architecture and Interiors; New York City in Edie Cohen, "Hold the Trays," Interior Design 69, no. 9 (Sep. 1998): 252-55; PhotoCrd: David M. Joseph / 2000 St. Martin's Lane Hotel, Lobby  Philippe Starck, Anda Andrei; Design, Ian Schrager Co.; London, England in Melissa Barrett Rhodes, "Room with a Hue," Interior Design 71, no. 1 (Jan. 2000): 127-32; PhotoCrd: Todd Eberle / Coal bar, Marcel Hotel  Jeffrey Goodman, GoodmanCharlton, design; New York City in Sheila Kim, "Burn, Baby, Burn," Interior Design 73, no. 2 (Feb. 2002): 64; PhotoCrd: Michael Kleinberg, Antoine Bootz / Morimoto Restaurant  Karim Rashid, DAS Architects; New York City in Craig Kellogg, "Chef's Choice," Interior Design 73, no. 2 (Feb. 2002): 158-63; PhotoCrd: David Joseph / Li Cuncheddi Hotel, Lobby Lounge  Fabio Novembre, architecture; Sardinia, Italy in Donna Paul, "Sleep Chic," Interior Design 74, no. 1 (Jan. 2003): 228-43; PhotoCrd: Alberto Ferrero / Tabú Ultralounge, MGM Grand Hotel & Casino  Jeffrey Beers, architecture & interior design; Las Vegas, NV in Aric Chen, "Ultra Vegas," Interior Design 74, no. 7 (Jul. 2003): 238-43; PhotoCrd: Eric Laignel / Seven Nightclub  II by IV Design Associates; Toronto, Canada in "IIDA Awards," Interior Design 74, no. 8 (Aug. 2003): 86; PhotoCrd: David Whittaker / Avalon Nightclub  Desgrippes Gobe Group; Chelsea, New York City in Stephen F. Milioti, "Back in the Limelight," Interior Design 74, no. 9 (Sept. 2003): 250-55; PhotoCrd: John Horner / Frisson Supperclub  Scott Kester, Constructive Projects; Tim Murphy, Architecture TM; San Francisco, CA in Zahid Sardar, "Bon Voyage," Interior Design 76, no. 2 (Feb. 2005): 175; PhotoCrd: David Wakely / Bradley Ogden, Lounge, Caesar's Palace Hotel & Casino  Engstrom Design Group; Las Vegas, NV in David Kaufman, "Fireworks: Luck Be a Ladle," Interior Design 76, no. 3 (Mar. 2005): 214-18; PhotoCrd: Eric Laignel / Washington Square, restaurant lounge  David Rockwell Group; Philadelphia, PA in Jorge S. Arango, "The Secret Garden," Interior Design 76, no. 6 (Jun. 2005): 204-09; PhotoCrd: Eric Laignel / Various W Hotels [2005-2011] Yabu Pushelberg, Times Square; Rockwell Group, New York; Studio Gaia; Mexico City, Seoul; United Designers; Doha in Edie Cohen, W: Where, When, and Why," Interior Design Web Archives (Nov. 2009); PhotoCrd: Interior Design Courtesy of W, Starwood Hotels / W Seoul, Lobby Lounge  Studio Gaia, Tony Chi and RAD; Seoul, Korea in Raul Barreneche, "W Hotel," Architectural Record Web Archives (Nov. 2005); PhotoCrd: Seung Hoon Yum / Hospital Club, Bellini Bar  Suzy Hoodless; London, England in Ian Phillips, "Walk Through: A Ward Wins," Interior Design 76, no. 7 (Jul. 2005): 72-76; PhotoCrd: Tom Mannion / STK Restaurant (bar and lounge)  ICrave Design Studios; New York City in Rebecca Flynn Marks, "Fit for a Lady," Interior Design 78, no. 9 (Sep. 2007): 130-34; PhotoCrd: Eric Laignel / Town Danceboutique  Studios Architecture; Washington D.C. in Annie Block, "Best of The Year Awards 2008" Interior Design Web Archives (Dec. 2008); PhotoCrd: Interior Design, Courtesy of Studios Architecture / Various W Hotels [2005-2011] Yabu Pushelberg, Times Square; Rockwell Group, New York; Studio Gaia; Mexico City, Seoul; United Designers; Doha in Edie Cohen, W: Where, When, and Why," Interior Design Web Archives (Nov. 2009); PhotoCrd: Interior Design Courtesy of W, Starwood Hotels / 2010 Betel Restaurant, Lounge  Martin Brudnizki Design Studio; New York City in Kate Sekules, "Cool as a Cucumber," Interior Design Web Archives (Oct. 2010); PhotoCrd: Anonymous / Lair  Alex Lotovsky, Citiscape Construction Group; New York City in Katie Tandy, "Lair Lounge NYC," Hotel Design, (May 2011): 12-13; PhotoCrd: Katie Tandy / OZONE, Bar and Lounge, Ritz-Carlton Hotel  Kohn Pedersen Fox Associates PC; Wonderwall, interior design; Hong Kong, China in Tony Smyth, "Hi Luxe," Hotel Design, (May 2011):24-34; PhotoCrd: Courtesy of Ritz-Carlton Hotels; "Ozone Bar by Wonderwall," http://hypebeast.com/2011/09/ozone-bar-by-wonderwall/ (accessed Sep. 16, 2011). 2) Wells, Carla. "Theory Studies: Archetypical Bar and Nightclub Practices in Contemporary Interior Design." M.A. Thesis, Cornell University, 2012, 194-241.